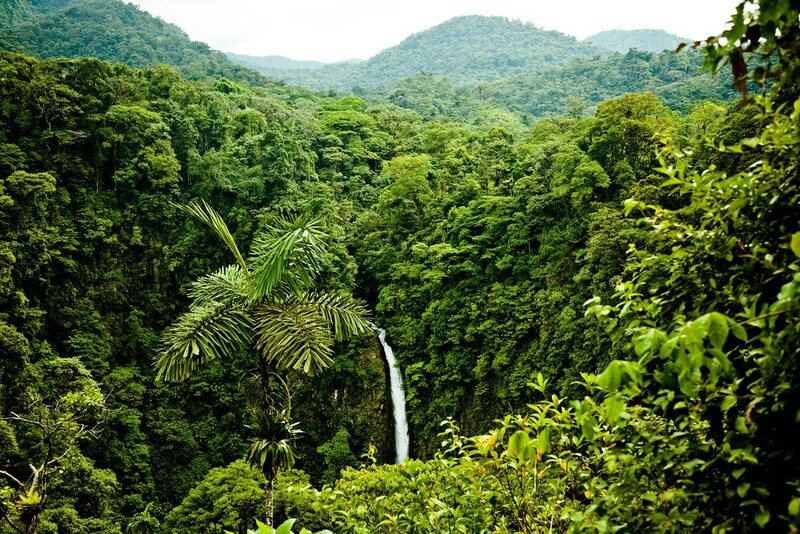 Costa Rica is one of the best places to go for people who love the rainforest, eco-tourism and lots of adventure! Here is a shot of the La Fortuna waterfall in Arenal. It’s a pretty challenging hike down steep slippery steps to the bottom – but it’s well worth it to swim in the cool water at the base. As I’m writing this I’ve been in Costa Rica almost 4 days now, but it feels like it’s been weeks. I’m going home tomorrow, but I wish I could stay a lot longer. There is so much to see here, and it’s so spread out. In my short stay I did quite a lot of things. After landing in Alajuela I took a taxi to a little restaurant called Calalu where I waited for 4 hours to be picked up by my shuttle to a hotel I was staying at 3 hours away in Arenal. There I had a delicious lunch – fried plantain with queso and bread fruit with bean dip. An amazing caribbean meal to start my vacation! The shuttle to Arenal was an interesting one. For most of the trip we were just driving through lush, green mountains. Sometimes it was raining really hard, sometimes it was foggy, but it was always beautiful. The roads in some areas are paved very nicely in Costa Rica, but in some places they aren’t paved at all – and full of pot holes. But it’s all part of the experience! I was a bit worried about all the rain on the first day. I knew I was coming in rainy season and taking a chance on the weather – but I was hoping to have good luck. Thankfully that was the most it rained on my entire trip – it hardly rained at all the 4 days I was there, and when it did it was just a refreshing little afternoon shower that cleared up quickly. As they say here – if you don’t want to be rained on don’t come to the rainforest! The best part of the trip to Arenal was when our driver spotted a sloth in a tree on the side of the road. I still can’t believe he spotted the thing just driving along, since it was extremely high up in the tree and very hard to see. It wouldn’t be the last time a Tico amazed me with their ability to spot forest creatures in the trees. Once we got to Arenal we drove way up an unpaved crazy mountain road to my hotel – Arenal Observatory Lodge. It looked beautiful all lit up in the forest at night, right beneath the volcano. I ate dinner in candlelight in the fabulous little restaurant there. I stayed in “La Casona” which is a little off-site cabin about 500 meters from the main hotel that is much cheaper w/ private rooms but shared bathrooms. I had an incredible view of the volcano and the lake beneath it, and the shared bathroom thing wasn’t a big deal at all. I hardly ever saw the other people using them, and they were very clean and we had a huge, beautiful common area with lots of chairs and couches too. The only part about it I didn’t like was the 1/2 mile walk up the mountain back to the lobby, and not having internet in my room. But that’s life when you’re staying a lodge in the rainforest! The two excursions I planned for Arenal were horseback riding to La Fortuna’s waterfall and Baldi Hot Springs. Both were incredible. The horseback riding was like a private tour because I was the only person who booked it that afternoon, so it was just the guide and myself. We rode and hour 1/2 through rainforest, fields, rivers, mud, uphill, downhill, and even through herds of bulls before we reached the entrance of the park (which for the less adventurous, you can just be dropped off at by a taxi). To get to the base of the falls you then climb down hundreds of steep, slippery steps – not gonna lie, I was out of breath and shaking a bit at the bottom, and had finished off all my water. Thankfully another friendly hiker informed me that the water in the pool at the base of the falls was 100% safe to drink spring water. I filled up my water bottle and started drinking – tasted better than the bottled stuff and it was fresh from the source. I then swam in the pool – which was a bit tricky. The rocks are very big and slippery, and there is really no easy way in – you have to perch yourself precariously on the rocks and then kind of lower yourself in slowly. It’s not for people who hate touching slimy algae covered rocks, I can tell you that. I swam for a few minutes in the cold, refreshing water before climbing out to get back to my horse that was waiting for our ride back. After the hour 1/2 ride back to the horse ranch I was extremely sore. It was the most intense horseback ride I’d ever done. I had let the horse trot a lot and even canter for a bit – which for an inexperienced horseback rider hurts a LOT. You have to use every muscle in your body to hold on to the horse and not fly off. Baldi Hot Springs was the perfect choice for an activity following the horseback ride – not many things are more relaxing and soothing than soaking in super hot water. Under a waterfall. In the moonlight. Ah-mazing. To top it all off, it was right under the volcano and I got to see a small eruption too. The following day I headed out to Monteverde, an area famous for it’s cloud forests. There are two ways to get there – the faster way is by boat. I took the boat. It was a glorious ride across the lake, with views of the surrounding rainforest, Arenal Volcano, farms, mountains and more. There was another hour and 1/2 drive through the countryside to Monteverde even after the lake crossing. I probably would have enjoyed it a lot if I hadn’t been sitting backwards. Never, ever sit backwards while driving through Costa Rica. On that shuttle I met a ton of nice people – most were American, and one was from Holland. I love Dutch people. When I got to my hotel (Hotel Belmar) I went to eat lunch, and as I was eating outside a cloud just floated right into the hotel. Seriously. I could feel the mist of it as it passed by. After lunch I headed out to a suspension bridge tour. The tour was absolutely fabulous… walking through the canopy of the forrest with clouds rolling by. The one complaint I have is that I never saw a single monkey, sloth, parrot, toucan, or pretty much any creature I wanted to see. I did get chased by a wasp though! The trees, the sounds of the birds and the streams flowing far below you are beyond words. The next morning in Monteverde after a wonderful breakfast at my hotel I got a taxi to Monteverde Reserve, the most popular cloud forest in the region. Once there we started a guided hike with a wonderful guide named Jorge, who’s nickname was Coki. He told us it was a common nickname for Jorge in Central America. Coki could make every bird noise imaginable, and knew the name of every plant and animal in the forest. He even told us of his adventures as a child pretending to be Tarzan and showed us how easy it is to swing from the vines and hanging roots. We got to see tons of amazing trees, plants, flowers and bird – including 14 species of hummingbird. Coki was searching intently for the rare and beautiful Quetzal for us – but it’s not the right time of year to see them in Monteverde. They usually migrate too the lowlands by the Caribbean for the rainy months. Coki also informed us that he’s never once seen a Jaguar in his 20 years as a rainforest guide. Which both saddened me and made me feel a lot safer. Despite not spotting any monkeys, Quetzels, or Toucans, it was an amazing tour and I learned so much. I also got to climb inside a huge tree. And as fate would have it, as I was leaving the reserve via taxi, we saw another taxi pulled over and lots of people standing in the road staring up at a tree. In that tree was a Quetzal. I could easily see why they are the most beloved bird of all to the Ticos – they are gorgeous birds, and very cute too. The Quetzal has an amazing history in Central America too – the ancient deity Quetzalcoatl’s name comes from the serpent-like movement of the Quetzals’ long tail feathers as it circles through the air when it’s mating. After the Monteverde tour I arrived back at Hotel Belmar and had a fabulous coffee filet minion for dinner, and packed it in for my long shuttle ride back to San José in the morning. We briefly passed by the Pacific ocean on our drive which was a nice surprise! Overall my stay in Costa Rica was absolutely incredible and I cannot wait to return to this beautiful country again someday.